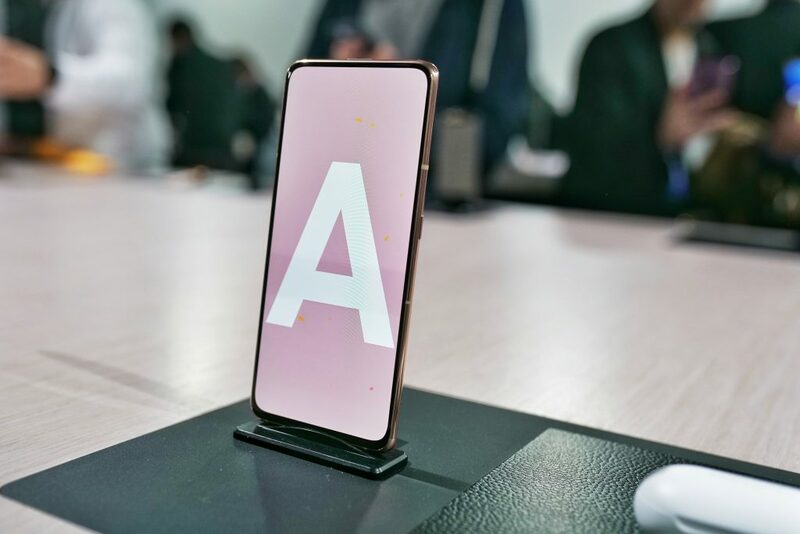 You are at:Home»Android»Samsung Galaxy A80 – First Impressions – More than just a gimmick? The standout announcement from the new additions to the refreshed A-series lineup is the Samsung Galaxy A80, expected to ship May 29th. The A80, follows the A20e and A40, which had already been soft launched regionally, and the A70, which soft launched online, prior to the A80 launch event. Keen to drive mid-range phone sales, Samsung has created a competitive lineup of smartphones that boast beautiful designs and decent specs, without breaking the bank! With a heavy emphasis on the “era of live”, Samsung has restored the signature Super AMOLED infinity display in the Galaxy A80, lost in the Galaxy S-series this year. The thinking is that young/creative types want as much screen real estate as possible, but they also don’t want to compromise on camera and video features. “The Galaxy A-series reflects our vision to be an innovator of new mobile experiences that transcend platform and location,” said Samsung’s DJ Koh while speaking live from Bangkok. Aimed squarely at a younger generation, singled out by Samsung as “digital pioneers”, the Galaxy A80 has a large 6.7-inch Full HD+ AMOLED display, uninterrupted by cut-outs or notches. It’s the first Galaxy device with a full screen design, with no front facing camera, the new infinity display is truly all-screen. 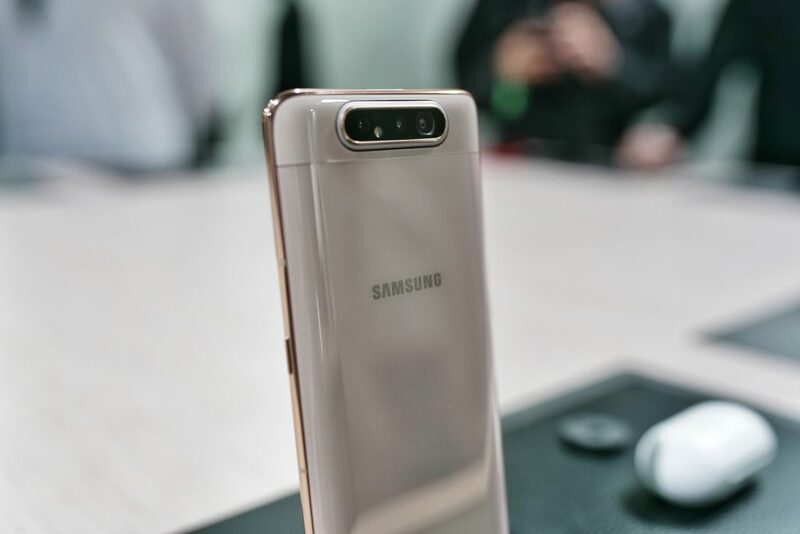 Samsung Galaxy A80 has no front-facing camera – So what about selfies? Samsung has come up with an intriguing solution to an increasingly common issue. 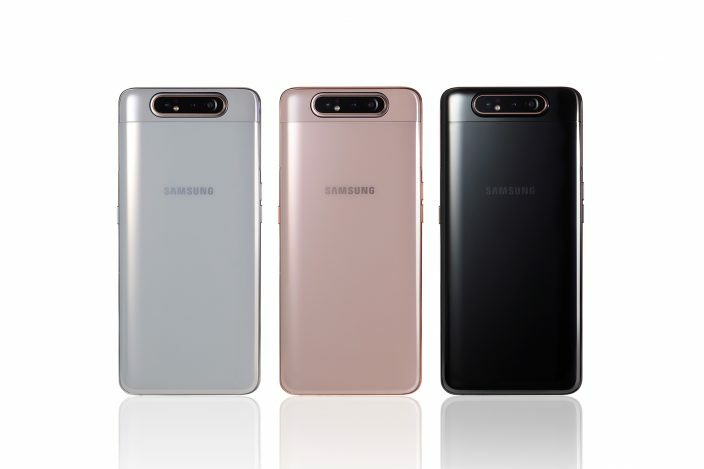 The Galaxy A80 has a triple camera setup, including a time-of-flight (ToF) depth sensing camera, a 48MP f2 main camera and an 8MP f2.2 ultra-wide (123-degrees) camera. 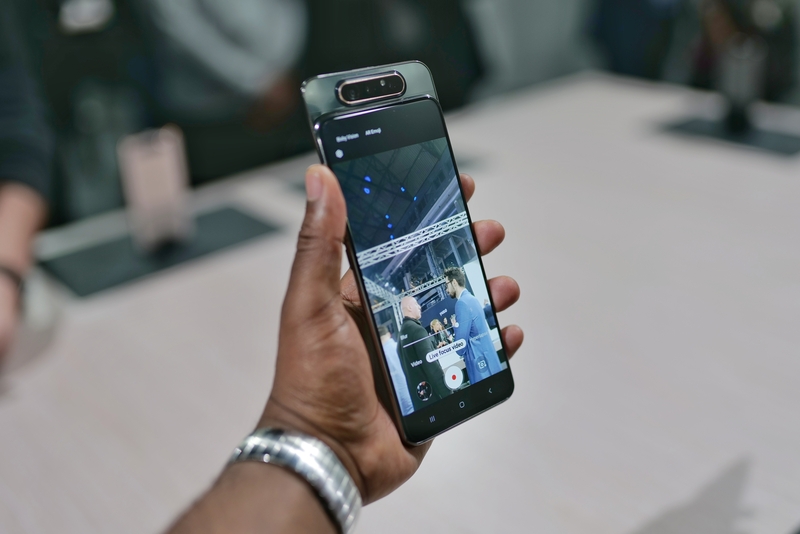 And when you want to take a selfie or record a vlog-style video, the back of the phone slides up and the rear camera quickly rotates 180-degrees to face forwards. It’s a neat trick, giving the device an element of fun and novelty appeal. Samsung has also created an interesting augmented reality application that uses the A80’s ToF camera to measure and plot the distance between objects by pointing the device and adding 3D markers in space. It can detect the size of objects and using its depth perception features give accurate distance information. Its a feature that could help with DIY and it’ll also be great for creatives unfamiliar with tape measures. The A80 also promises “Super Steady” video, reducing shake during action and vlogging sequences and it can “see” the quality of pictures it captures in a sequence and let the user know which one is the best. It is also smart enough to implement background blur during video, thanks to the new Snapdragon 730 chip inside it. Three colours will be available at launch – I’m not making these colour names up btw – Angel Gold, Ghost White, Phantom Black. Which one are you feeling most? It may not have the largest battery at only 3,700 mAh, however, the A80 does offer 25W Super-Fast charging. 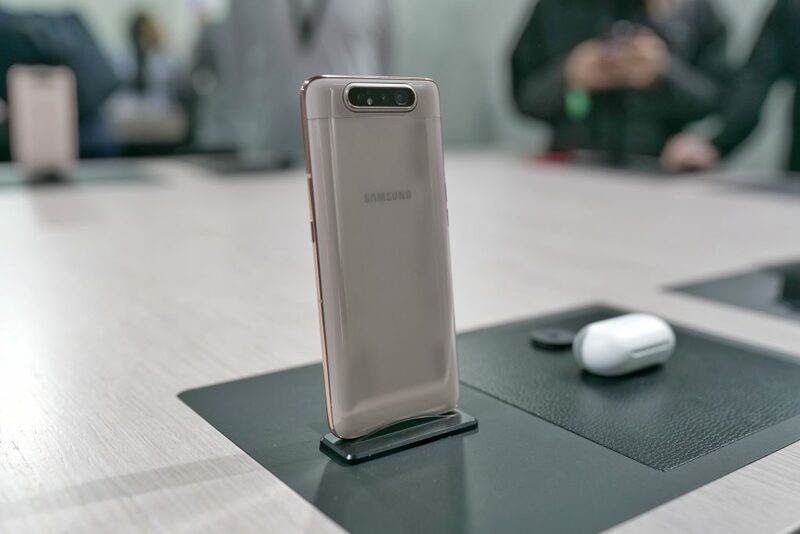 Samsung also says that it benefits from intelligent power management that will learn its owner’s usage patterns and optimise battery performance accordingly. This intelligent power management (Bixby Routines) includes pre-selecting apps used frequently together, such as camera and social media platform(s) of choice. We’ve seen similar performance management from the S10 and rival devices, so it’s good to see that coming in at this level. Initially, the Samsung Galaxy A80 makes a good impression, it makes you want to pick it up, and the notch/cut-out free Full HD+ AMOLED display is as immersive as it gets right now. It doesn’t come with a full suite of features, but it does offer some unique tools that will appeal to creatives, such as offering main-camera quality for selfies, vlogs and video calls. The rotating camera is a gamble, some people will love it, others will still well clear because moving parts add a point of weakness to a device’s structural integrity. We like that that Samsung has gone for something a little different, now we just want to see how it’s received. Aimed at young creatives, we think the A80 targets its market well, if it’s priced sensibly, Samsung could be on to a winner.